Please note that Internet bidding is not available for this lot. Interested parties that are unable to attend the sale may register to bid by telephone or place a commission bid online at rmsothebys.com. Almost as soon as the Veyron was introduced, Bugatti engineers were already thinking, “What’s next?” How does the company that produced the world’s fastest supercar continue to innovate and create a successor to the record-shattering and world-beating Veyron? The obvious answer was to start with the Veyron and use it as a basis to take their next generation supercar into the future. Per usual, Bugatti would utilize the very best of every available resource. 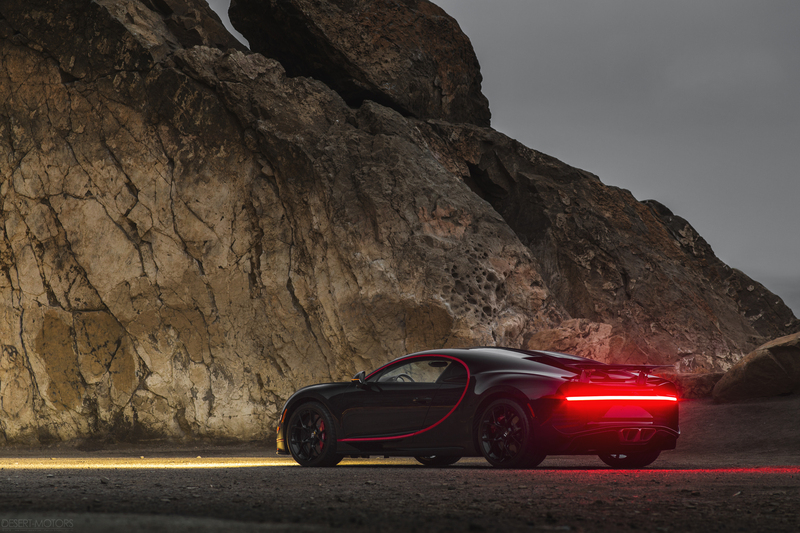 After nearly a decade of Veyron production, they had learned innumerable lessons from continuous testing, customer experience, and advances in technology that they would incorporate into its successor. The resulting magnum opus was christened the Chiron, after the Monegasque racing driver Louis Chiron. It was first introduced to the public at the Geneva Motor Show in 2016. The headlining feature was of course its top speed, an electronically limited 261 mph. This was a tad slower than the Veyron Super Sport, but then Bugatti limited the Chiron’s top speed due to the limits of its tires. Crunch the numbers, remove the limiter, and the Chiron would likely reach 285 mph, much faster than any other road-legal automobile on sale today. Just 500 examples were slated for production and, at the time of the car’s unveiling, a third of the production run had already been spoken for. While only a handful of Chirons have been delivered worldwide, the fanfare surrounding these cars has been nothing short of mesmerizing. Such was the buzz surrounding the first Chiron officially delivered in the United States during this year’s Pebble Beach car week. To the untrained eye, the Chiron maintains a level of visual similarity with its sibling Veyron, yet nothing could be further from the truth. 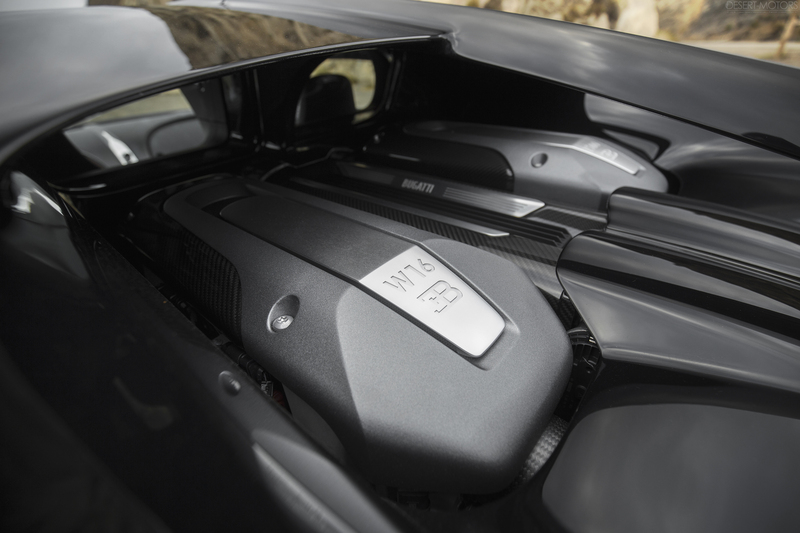 Increasing the output over the highest-specification Veyron, the Super Sport, by 300 bhp meant that Bugatti needed to re-engineer almost every aspect of the Chiron to cope with the additional power and performance. Like the Veyron, at the Chiron’s heart is the 8.0-liter quad-turbocharged W-16 engine, though a vast majority of its components are all new. A brand-new carbon monocoque chassis was produced utilizing carbon fiber with intertwined aluminum, giving it a structural rigidity comparable to that of a LMP1 race car. In terms of physical size, the Chiron is both slightly taller and wider than the Veyron, helping to enlarge the cabin and make it more comfortable for taller drivers. The Chiron’s carbon ceramic brakes are 20-mm larger and 2-mm thicker at all four corners (420 mm at the front and 400 mm at the rear), with all new forged aluminum calipers (eight piston at the front and six piston at the rear). • At 248 mph, the centrifugal force on each tire is the equivalent of 3,800 times the force of gravity. • If all of the carbon fibers used in the construction of the chassis were laid out end-to-end, the ensuing string would stretch the equivalent of nine times the distance between the earth and the moon. • 60,000 liters of air and 800 liters of water are pumped through the engine every minute. • At top speed, the fuel tank will run dry in approximately seven minutes. The Chiron on offer is the first U.S.-specification example ordered and is presented here unregistered and in as-new condition. It is ready and waiting to be taken to the limit and driven as intended. Since completion, it has only been driven 250 miles, which consist entirely of factory test miles to ensure that every aspect of the car was in perfect order prior to delivery. 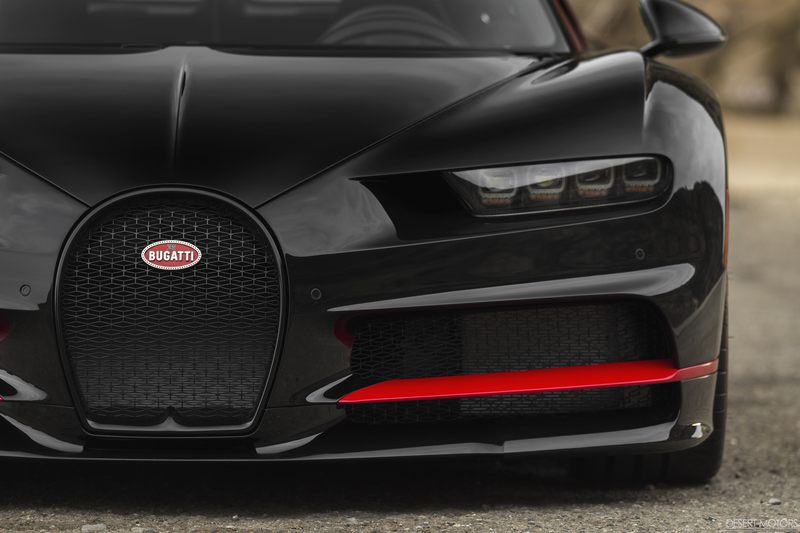 Finished in black with red highlights inside and out, as well as red brake calipers, this is a truly sinister-looking Chiron. It is ready to out-perform anything that dares challenge it. As a brand-new car, it is still accompanied by its factory extended warranty. Furthermore, the car includes a number of accessories and gifts for the first owner, including a 1:8 scale Amalgam model of this car, U.S.-specification rear bumper (the car is currently fitted with a slimmer R.O.W. specification bumper), and a quick owner’s reference guide. Befitting with the car’s attention to detail and immaculate craftsmanship, it is also accompanied by an aluminum Bugatti crate which contains the following: a leather box containing an extra key, speed key, flash drive, as well as the owner’s manuals, car cover, and trickle charger. The opportunity to acquire this Chiron marks the very first occasion that one has been offered at auction and represents a tantalizing opportunity. The winning bidder will take delivery of what is unquestionably the most anticipated car of the year, and one that boasts truly unrivaled performance and style. Like its predecessor, it is an automobile that pushes the boundaries and breaks them into oblivion.